Is a Shar-pei Considered Dangerous? Shar-pei: cuddly creature or aggressive Cujo? Shar-peis are born as cuddly creatures boasting irresistible wrinkles, similar to those found in chubby babies. The cuteness factor, though, seems to abruptly fade off 50 pounds later once these bundles of joy grow into imposing adults. This breed is often targeted by breed-specific legislation, bans and legal liabilities. Shar-peis were initially used to work on farms. These versatile dogs were used as all-around working dogs responsible for hunting wild boars, guarding livestock and herding. They were also used as household guardians to protect property. Besides being used on farms, this breed was also later used in dog fights. The rough coat and loose skin of these dogs served a purpose: they helped defend the original shar-pei from wild boar attacks, and in the dog-fighting ring enabled it to maneuver and bite back, should an opponent dog grab onto the skin. As a good guardian dog, this breed can be very territorial and is described as being standoffish with strangers, according to the American Kennel Club standard. However, an aloof personality should not be interpreted as aggressive. Early socialization with children, strangers, and other animals may help prevent or reduce the chances of this dog's becoming suspicious and possibly dangerous. Extensive exposure to all kinds of people will help your shar-pei discriminate between the normal behaviors of good guys and the abnormal behaviors of potentially not-so-good guys. While a shar-pei may not throw a party when guests are invited over, there is no denying that they are extremely loyal and devoted to their families. However, shar-peis have a tendency to be independent, stubborn and strong-willed dogs. "These dogs are not pushovers to train and raise," explains Michele Welton, a dog breed adviser, obedience trainer and canine behavior specialist. This means the breed is not for everyone. In the wrong hands, like any breed, the shar-pei has the potential to become dangerous. When it comes to socializing and mingling with other dogs, a shar-pei can be a party pooper. This breed can be dangerous around other dogs. The breed's past use as a fighting dog may cause aggression in some specimens, especially if they were poorly socialized with other dogs as puppies. Early socialization and training may help you get better control of your shar-pei around other dogs. You should use positive reinforcement to reward good, nonthreatening behaviors, and pay attention when your dog is around other dogs, according to Jeff Vidt, a veterinarian specializing in shar-peis. This breed may also see cats and other fleeing creatures as a tempting delicacy. The snobbish and strong personality of this breed may make it a poor companion for young children. If you have young children, many shar-peis will simply refuse to tolerate any nonsense from them, explains Michele Welton. There are some safer and more child-friendly dogs if you have young ones or are planning to have the stork visit you one day; however, keep in mind that no child should ever be left unsupervised with any dog, regardless of breed. While it is true that the first shar-pei specimens introduced to the United States in the 1970s had awful dispositions, it is also true that in the past decades this breed has improved considerably. Fortunately, conscientious breeders have worked hard to reduce aggressive tendencies in this breed. It would be a rare instance today to find a shar-pei with a bad temperament, according to the Centennial Chinese Shar-pei Club. Determining if a breed is dangerous requires many considerations. Bite statistics categorized by dog breed may look like a good source of information, but they do not take into account the environment in which the dog was raised, the circumstances surrounding the bite or the actual type of bite; therefore, they do not reveal the whole picture. Looking at individual temperament breed scores collected by the American Temperament Test Society may provide a clearer picture on the breed's ability to cope with humans and the environment. As of the latest testing, out of 212 Chinese shar-peis, a good 150 passed and 62 failed. That gives the shar-pei breed a score of 70.8 percent. So is that wrinkly ball of fur as cuddly as he looks or does he have the potential to turn into Cujo the moment he grows up? 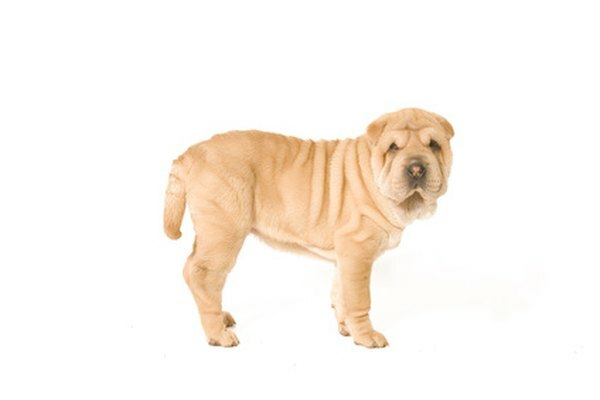 Like any other breed of dog, the Chinese shar-pei can have temperament problems when bred improperly. Generally, a well-bred and well-socialized shar-pei, raised by owners who commit to training him and meet his needs for exercise and mental stimulation, should not cause problems. As with other breeds, there are always chances of bad apples within a batch, but it ultimately all boils down to genetics and how the dog is raised.